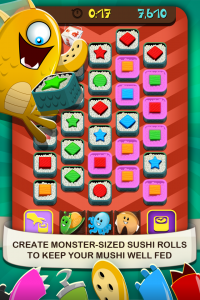 In Sushi Mushi, players battle against others, using monster characters to create sushi rolls from numerous sushi bites. Sushi rolls are constructed by either color or shape, with the option to create offensive and defensive rolls for added bonus points. The player who achieves the highest score at the end of three rounds is crowned the winner. 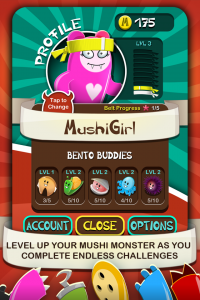 Sushi Mushi lets players battle against friends and family using Facebook Connect, and utilizes asynchronous multiplayer so that gamers can play whenever and wherever they want. A solo, single-player snack mode is also available where players complete new challenges to improve their sushi making skills. Gamers obtain new belt levels as they progress and complete achievements with their monster, leveling them up to become monster sushi masters. Aspyr media has released a new launch trailer for Sushi Mushi; sharpen your monster teeth and check it out here: http://youtu.be/pOs5m1Skoy8. Aspyr Media, Inc. is the leading publisher of Mac® and iOS games, bringing blockbuster gaming franchises including Call of Duty®, Sid Meier’s Civilization®, Star Wars®, and DOOM® to Mac computers around the world. Headquartered in Austin, TX, Aspyr develops, markets and sells games for the Mac which are delivered through physical retail and digital download services. More information about Aspyr and its games may be found at www.aspyr.com . All marks and trademarks are the property of their respective owners. Check out the new launch trailer for Sushi Mushi at the following link: http://youtu.be/pOs5m1Skoy8. Download the press kit here (85 mb).